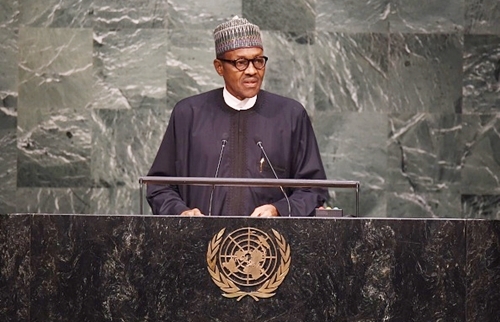 Addressing world leaders at the 70th General Assembly of the United Nations yesterday in New York, President Muhammadu Buhari has called on the international community to urgently redouble its efforts to strengthen mechanisms for dismantling safe havens for proceeds of corruption, urging his counterparts to do more to return stolen funds and assets to their countries of origin. The President reaffirmed his administration's determination to frontally confront the twin evils of corruption and illicit financial outflows, as he observes that corruption, cross-border financial crimes, cyber crimes and human trafficking are major challenges of the 21st century which the international community must work collectively to overcome. "By any consideration, corruption and cross-border financial crimes are impediments to development, economic growth, and the realization of the well-being of citizens across the globe. In particular, I call upon the global community to urgently redouble efforts towards strengthening the mechanisms for dismantling safe havens for proceeds of corruption and ensuring the return of stolen funds and assets to their countries of origin," he said. "The Secretary-General has grouped the SDGs into what he calls six 'essential elements' namely: Dignity, Prosperity, Justice, Partnership, Planet and People. As a prerequisite to these and as we look at history and remember the terrible events that gave rise to the birth of the United Nations in 1945, I would like to propose a seventh: PEACE." He asserted that peace is close to the hearts of Nigerians, as the nation is in the front line in the war on terror from Boko Haram’s islamic sect. "This is a war between progress and chaos; between democracy and the rule of law. Boko Haram celebrates violence against the weak and the innocent and deplorably, they hide behind their perverted interpretation of Islam. Boko Haram is as far away from Islam as anyone can think of." "The new Nigerian Government which I have the honour to head, moved with dispatch to put in a bold and robust strategy to defeat Boko Haram. Nigeria and her neighbours Cameroon, Chad and Niger plus Benin are working together to face this common threat within the regional framework of the Lake Chad Basin Commission. We have established a multinational joint task force to confront, degrade and defeat Boko Haram. We have driven them away from many of their strongholds, killed or captured many of their operatives or commanders and freed several hundreds of hostages." The President reassured the international community that rescuing the Chibok girls remains one of the major objectives of his administration. "We are working round the clock to ensure their safety and eventual reunion with their families. The girls are constantly on our minds and in our plans." President Buhari also condemned the new and dangerous dimension which human trafficking has assumed in the world. "We condemn in the strongest terms these people traffickers and will support any measures to apprehend and bring them to justice." "The international community has come to pin its hopes on resolving the Palestinian issue through the two – states solution which recognizes the legitimate right of each state to exist in peace and security. "The world has no more excuses or reasons to delay the implementation of the long list of Security Council resolutions on this question. Neither do we have the moral right to deny any people their freedom or condemn them indefinitely to occupation and blockade," Buhari added.